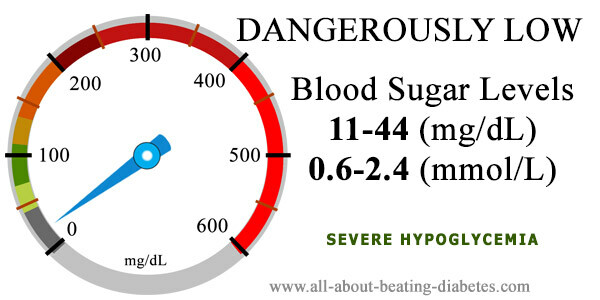 Blood sugar level 11 12 13 14 15 16 17 18 19 20 21 22 23 24 25 26 27 28 29 30 31 32 33 34 35 36 37 38 39 40 41 42 43 44 mg/dl are considered very low and immediate measures should be taken in order to elude death. Even if you have set some targets with your physician of what means too low blood sugar for you, these numbers are still considered too low or even mortal. There are some typical symptoms of hypoglycemia that you should be aware of in order to take immediate measures and prevent serious problems (like death for example). Most common symptoms include anxiety, Nervousness, irritability, shakiness, etc. However, I can admit that reaction to such low sugar level varies in different individuals. So, I always advise my diabetic patients to keep a glucometer with them in order to measure blood sugar anytime they might feel an unusual symptom. Apart diabetics, the non-diabetic persons can also experience dangerously low blood sugar level due to insulin reaction/shock. A normal and healthy individual can start having hypoglycemia symptoms even if the blood sugar (bs) can be higher than 70 mg/dL. This can happen when bs starts getting down very quickly. 1. Immediately take your glucose tables (around 20 grams). If do not keep glucose tablets with you, can consume two tablespoons of raisins or hard candies or gum drops. 3. If bs will get back to normal again, then, continue consuming a small snack, but not a regular meal. 4. In case, bs will persist low, then, should take the sugary candy again until complete normalization. 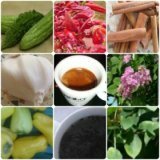 Get more details on specific causes to such dangerously low blood sugar levels as following: fasting, after eating and due to medications and how to prevent hypoglycemia episodes.